Tabs vs Spaces: Are we even arguing about the same thing? The big news this week (other than all that political news) is objective data in the ongoing battle of Tabs vs Spaces. 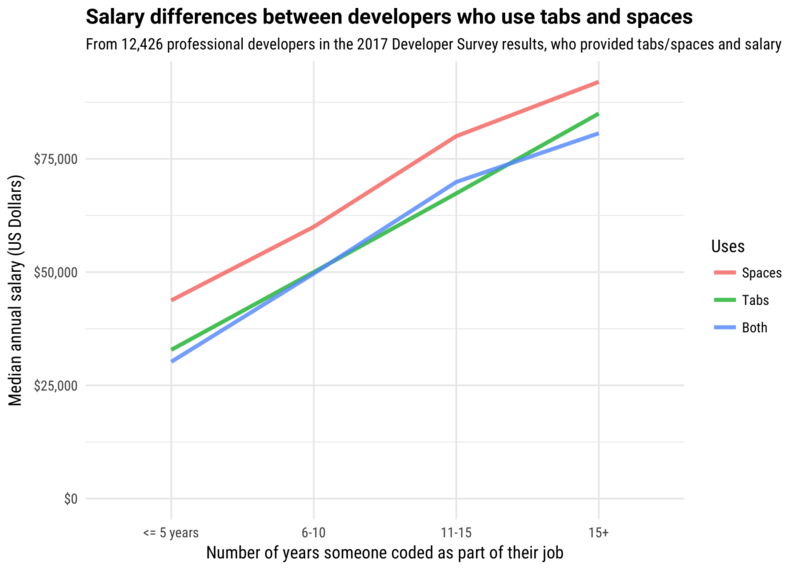 Stack Overflow’s annual developer survey uncovered an interesting correlation: collectively, devs who use spaces are earn more than those who use tabs. That is sure to add some fire to never-ending war, but what if the data is bad? What if people don’t actually know which camp they’re in? Stay with me here. But what if… people didn’t actually know which one they use? A lot of code editors recognize that people want to insert 32 four times when they press the “tab” key on their keyboard. These are frequently called “soft tabs”. With that setup, a person presses the “tab” key but inserts four space characters (32). Do these devs really think they are in the tab (9) camp? Comment from discussion calm-forest’s comment from discussion "My BF is a web developer and it is birthday next week.". Comment from discussion ADirtySock’s comment from discussion "My BF is a web developer and it is birthday next week.". Here’s someone who is saying that if you are pressing the “tab” key then you are in the “tab” (9) camp. Even if your editor is inserting four 32s. Could it be that many who think they are in the Tab Camp are actually on Team Space? If anyone has any more examples of this line of thinking, please leave them in the comments. As for me, I’m happy to be on the right side of this debate, and urge all devs to turn on their editor’s “visible whitespace” feature. I love this guide on what to do with money from /r/PersonalFinance. Money is complicated so it’s nice that they lay out each step in order. Top priority is to have an emergency fund, then getting 401k match, and so on. What’s the stupidest/weirdest project you used a RPi for? Comment from discussion What’s the stupidest/weirdest project you used a RPi for?. The NoIR module is a camera for the Raspberry Pi with no infrared filter, which means you can use IR LEDs to light up a room without anyone seeing.